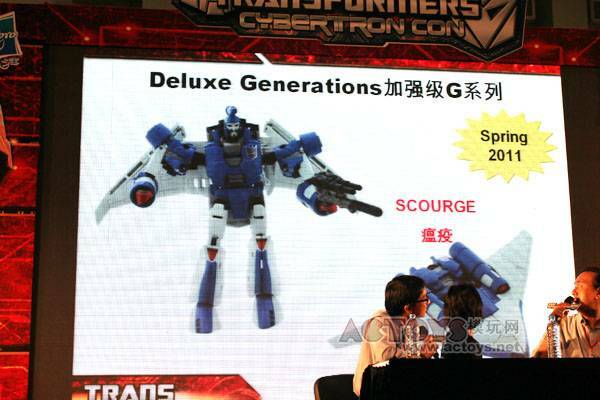 Home » Generations / Classics » Transformers Generations Classics 3.0 » Images from Cybertron Con New Transformers Products Panel – Scourge! 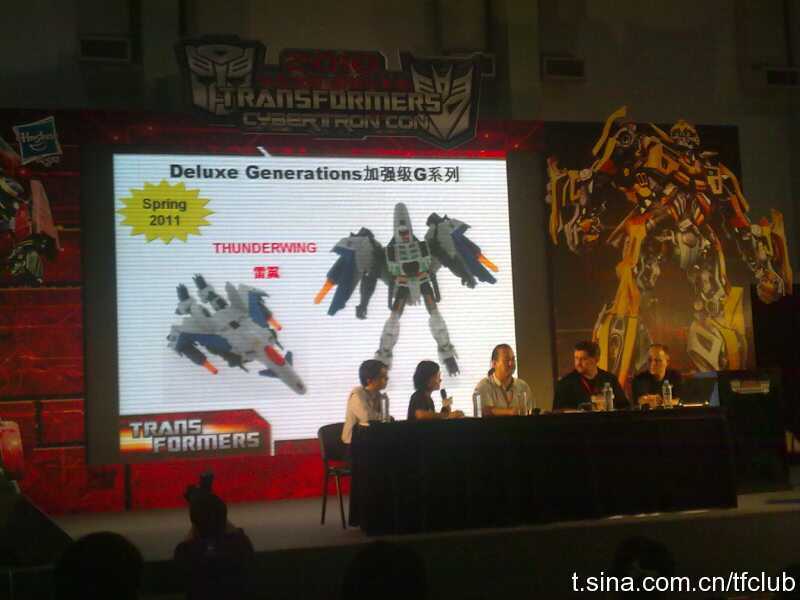 Thunderwing! Goldbug! Jazz! 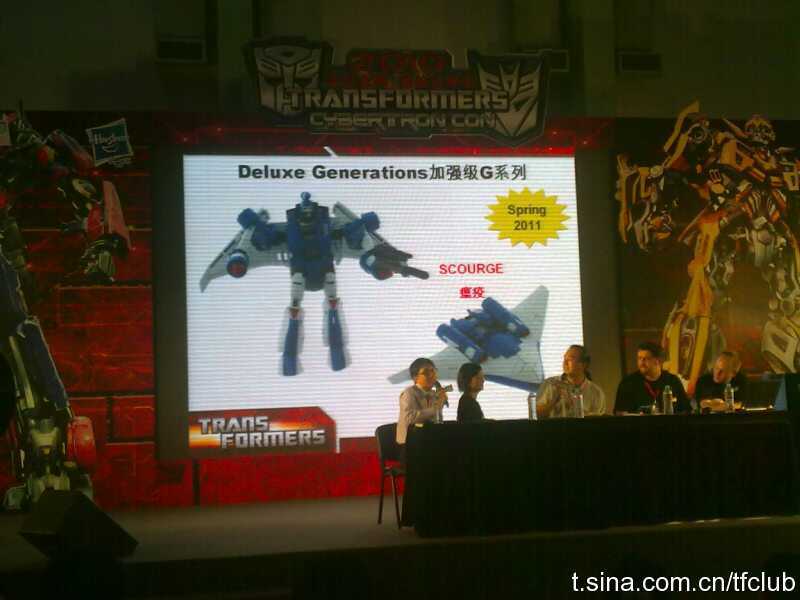 Images from Cybertron Con New Transformers Products Panel – Scourge! 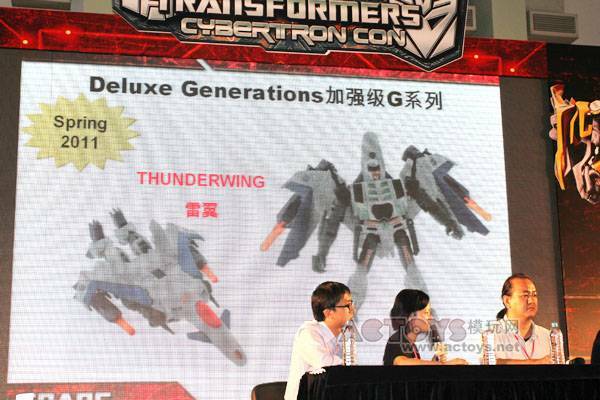 Thunderwing! Goldbug! Jazz! 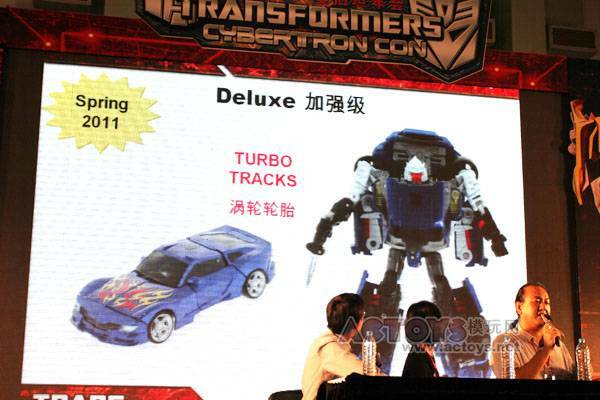 In a massive shocking turn of events, Cybertron Con in China has produced some incredible news we know many of you had been hoping to see come out of the San Diego Comic Con. At the Hasbro new products panel several of the new 2011 release Transformers toys were on show, and photos were allowed. 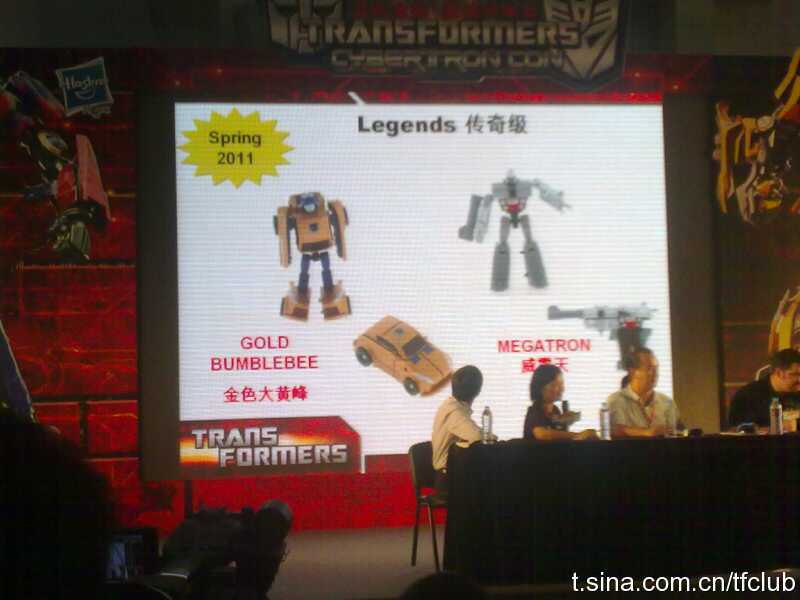 All of these images come from tfclub’s Tsina account (requires registration). Some higher resolution image are also available courtesy of Yeltar on ACToys. 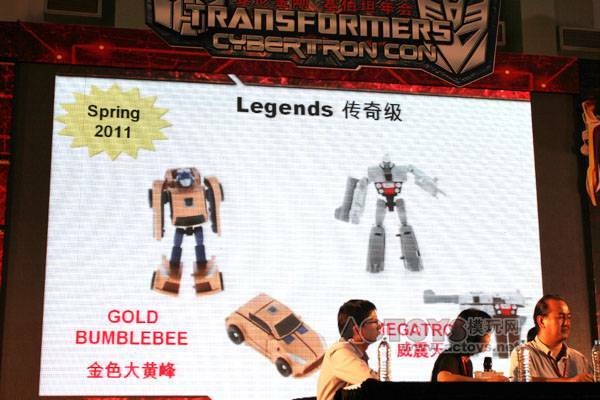 Revealed for the first time anywhere is Gold Bumblebee, who long time fans will recognize as a homage to Bumblebee’s upgraded form Throttlebot Goldbug from The Return of Optimus Prime! 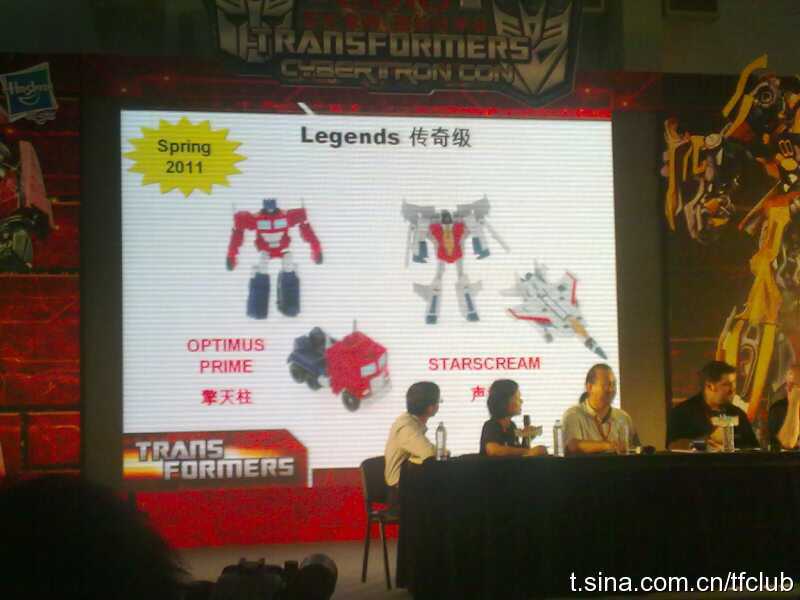 Also shown are the Legends Class Generation 1 Optimus Prime, Megatron and Starscream that were first revealed to be in the works at Botcon 2010. Windcharger. 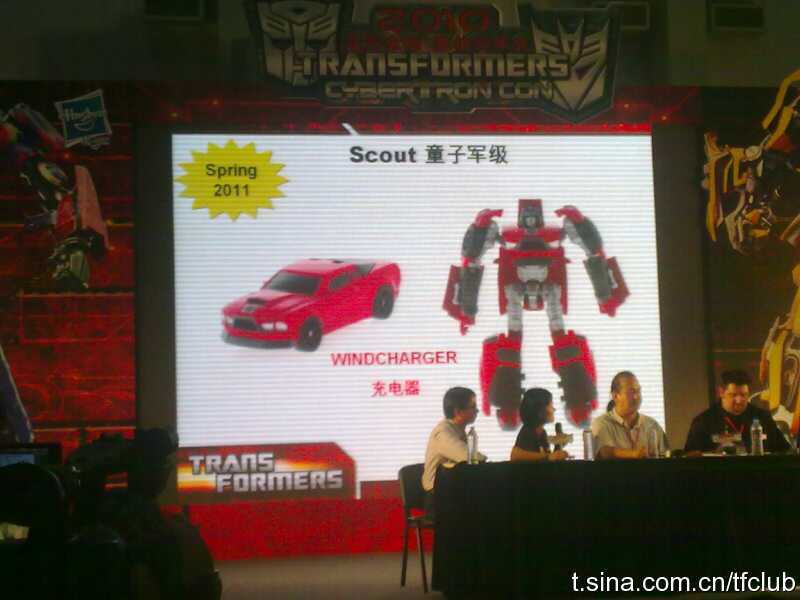 Just Windcharger. Check him out, he’s awesome! Here’s the mother-lode, what you’ve all been waiting to see. 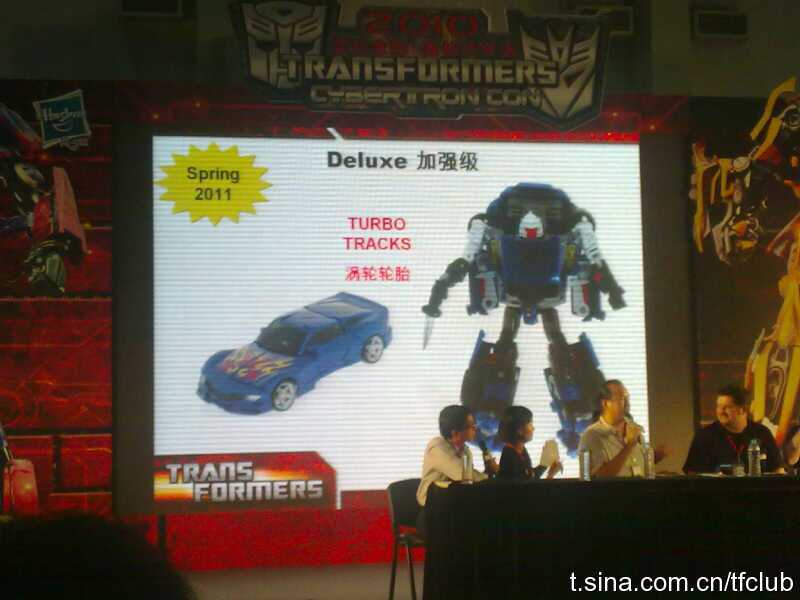 On show were: Special Ops Jazz, “Turbo” Tracks, Perceptor, Scourge and Thunderwing. 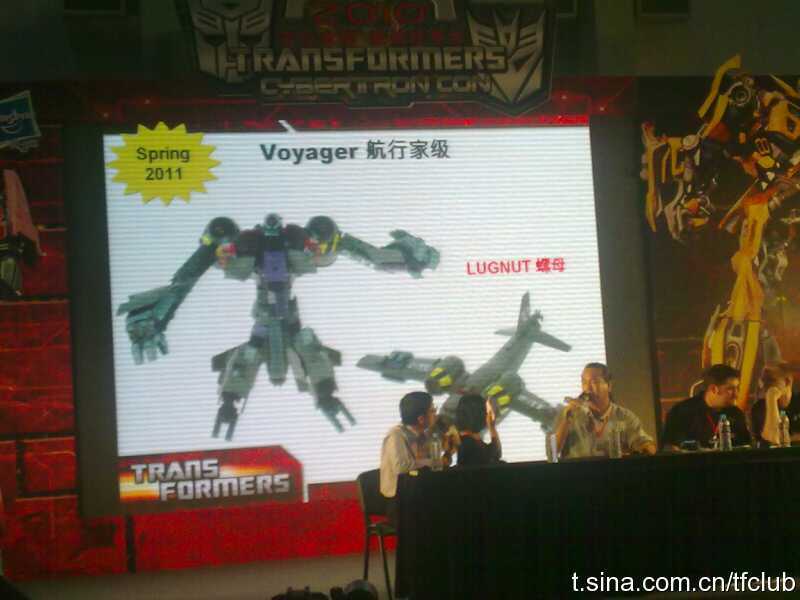 Lugnut and Grapple were shown. 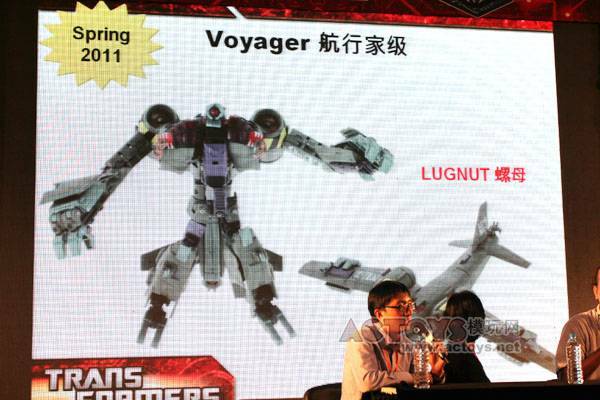 Lugnut looks a little mistransformed / awkwardly posed though. 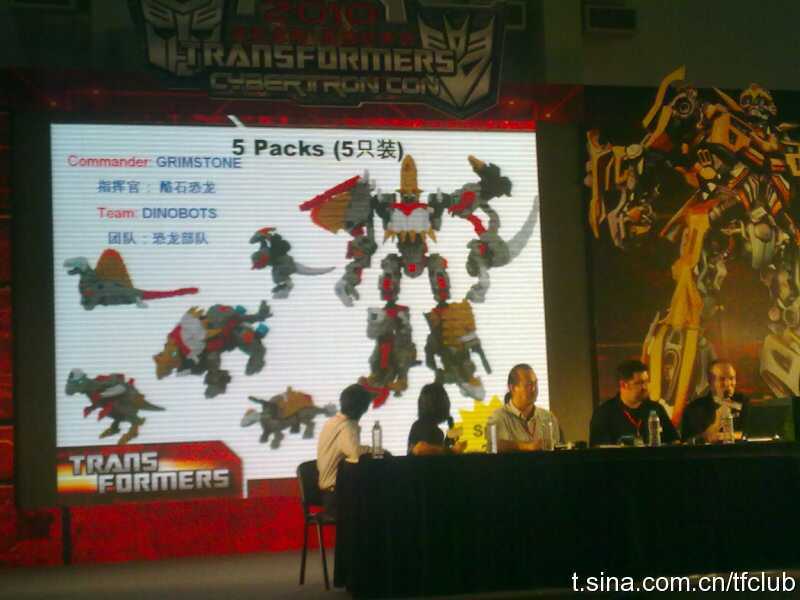 Grimstone with the Dinobots and Steamhammer with the Constructicons. Stay tuned for more news from Cybertron Con as it becomes available. What are you guys talking about? Grimlock renamed himself, scanned a new alt mode, then combined with the other Dinobots in the 1986 movie. It happened right after Sideswipe died. 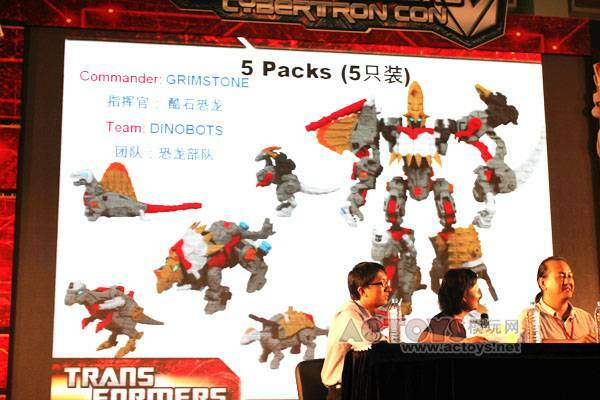 umm, i didnt think the dinobots combined, and wasnt Grimlock, not Grimstone, the leader, and didnt the Constructicons form up Devastator? The G1 Dinobots did not combine. The combining toy you see is the from the Powercore Combiner line and has its own fiction tied to it. And is based on drones forming the limbs of a comander and thus creating a giant robot. Yes, the Constructicons combined into Devastator. 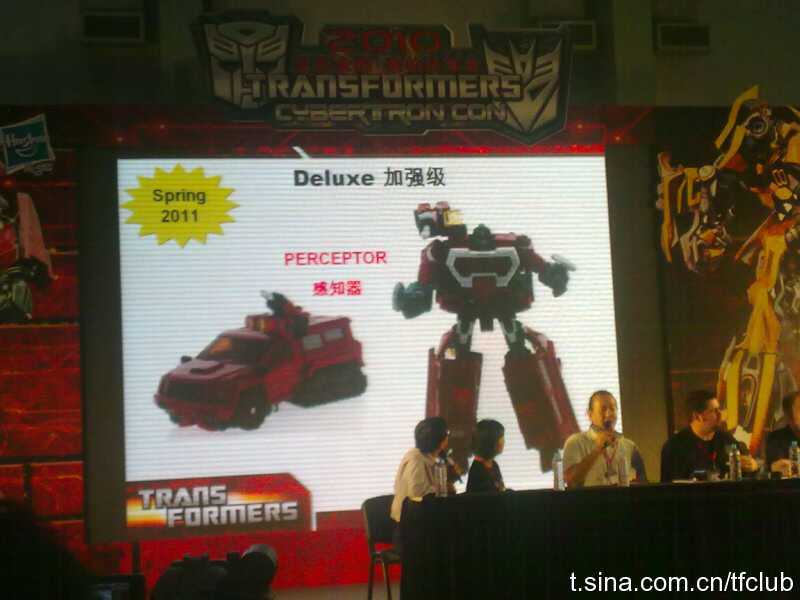 Powercore combiners are expansions of the characters in the corresponding subgroups/factions. The Kübelwagen, actually. Analagous to a JeEp? Heh I was mistaken. It was Porshe that did armored vehicles for the German army in WWII. And yeah the Kubelwagen was pretty much the equivalent for the Jeep. Hmm WWII Swindle? Oh, you mean those cars for the masses, or "folks-vagens", that Hitler commisioned? Stupid third largest auto-maker in the world, don't you know the wonderful publicity you would recieve from allowing kids to buy New-Beetle versions of Bumblebee? No, I think he means those "cars" with lots of wheels, threads, armor and with long pointy things that make "BOOM!" noises. No, they mean "Seventy-ish years ago, we made different vehicles, mostly for our government, for a purpose we'd really rather distance ourselves from these days." Ah, overlooked that. Though I will have to agree with another poster that I think they're taking it a bit far. Heil Bumblebee! Ein Volk! Ein Fuhrer! Ein Autobot! I suspect they really mean "for the license, you need to pay us more"
Blame VW for that. Something about "war toys". Don´t know the exact details. Lastly, it looks like there also will be a return of…RUBSIGNS! Aside from Scourge, all the Generations Figures have what look like Rubsigns on them (I can't see them on Jazz or Legends Optimus, but Jazz is missing a "4" on the left door and Optimus must have it on the left side, hidden from the camera). Even Grapple has one despite being HftD! 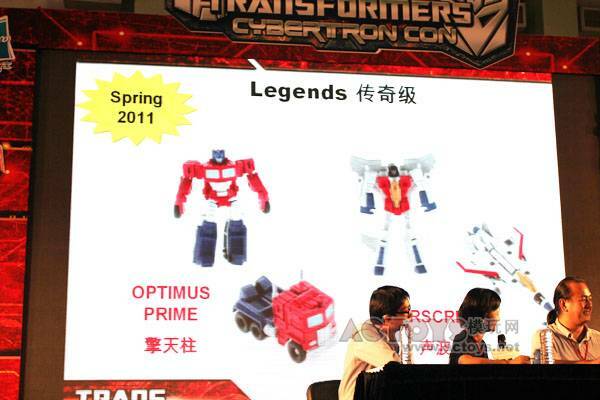 The only figures I see rubsigns on are Windcharger and the Legends figures. They're also the only one's that have been announced to have them. It's kind of hard to see, but Jazz does have a 4 on the other door. His arm is covering most of it, but part of it is visible. 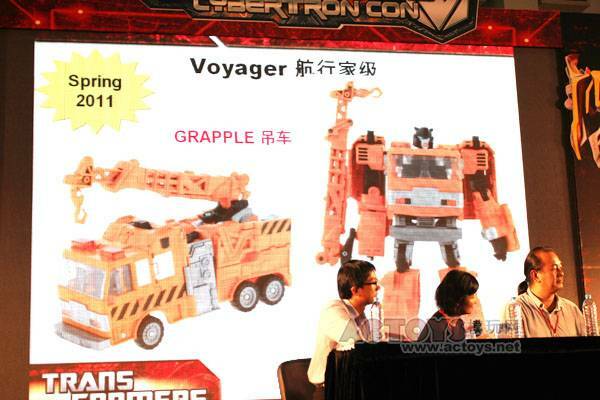 Grapple looks like he has a black Autobot logo on the side of his vehicle. Not that we won't see any rubsigns on any other figures, just that I don't see any evidence of that happening just yet. Volkswagen once stated that they didn't want any of their vehicles associated with war. While I agree with what they're attempting to do, I think that they're going a little far with it. Who knows, one day they might change their mind, and we'll finally get a new Bettle-bee, but till then, oh well. Bee as a Camaro or a generic compact car will do for the time being (imho). Bumblebee as a VW was also one of those things for me, and I'm just as happy as you are with the WFC altmode. I think it captures the spirit of the car(in some ways better than the new beetle did). A VW Beetle just makes me smile. It's very non-threatening, non-aggressive, and there's something child-like about it. I felt everything about it totally encapsulated the character. Classics Bumblebee is a very well made figure, and an a reasonably faithful update to the character. But I won't deny I was disappointed that they couldn't do him as a Beetle. Stuff that's unimportant to me would be the changes they made to things like classics Astrotrain. So long as he's still a shuttle and a train, it doesn't bother me in the slightest that he's no longer a steam locomotive. 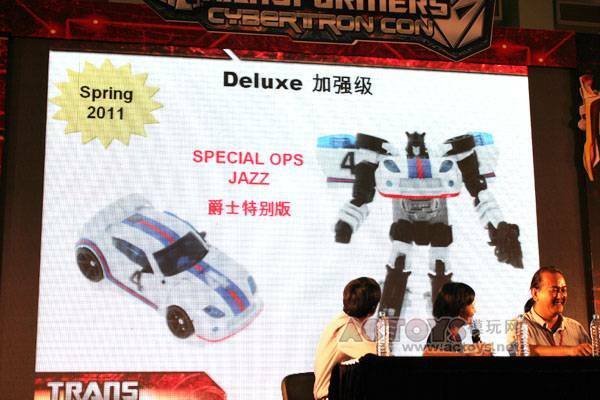 -Jazz: Boy am I glad they didn't just retool the Prowl/etc. mold for possibly THE most clamored for Classics figure of all! 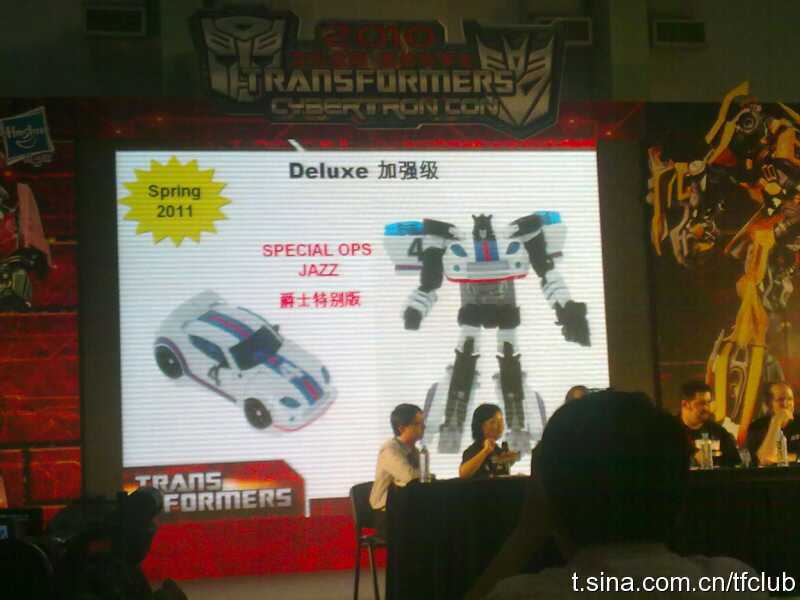 Totally must get, if for no other reason than to replace the Movie G1-deco Jazz I have standing in for Classics Jazz. -G1 Legends: If I can find the little bastards (they are very hard to find in the wild/retail stores around here), they will all be mine! Especially Megatron above all simply to have a proper gun-former at last and not just mini-cons. -Tracks: hideously mistransformed, as I can see what are supposed to be his missiles just hanging off the sides and his arms have to move out further from his body. However, that is so damn dead-on Tracks that I must see more of it. -Grimstone & Dinobots: Look really nice, the crappy "claw" hands in previous PCC's actually work thematically for this guy in my opinion. Doesn't look a whole lot like "The Beast", just a whole lot better. 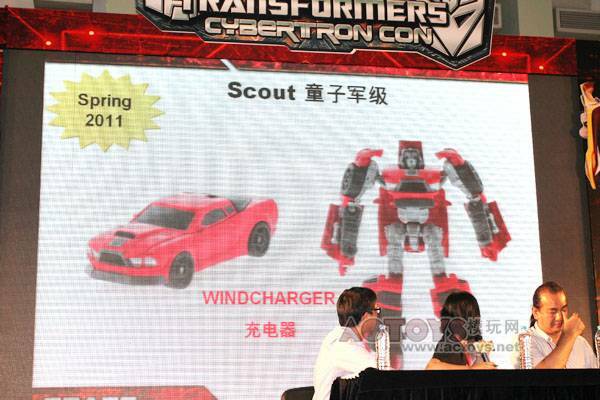 -Windcharger: Red muscle car scout is all I need to know and I'm sold. -Perceptor: That Alt. 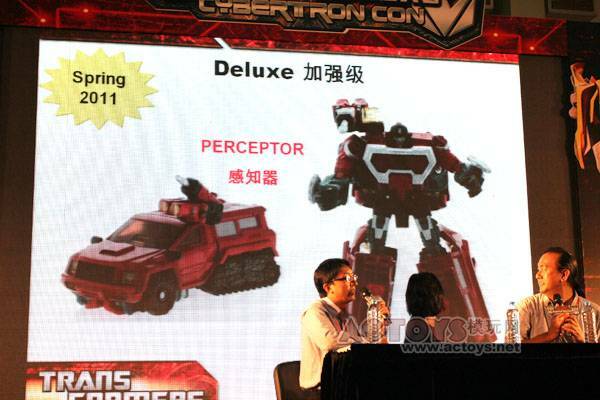 mode looks like a red Trailbreaker on E. Snow Cat's chassis, can't say I'm too hot about it with those rear treads. However, bot mode looks decently enough like Perceptor at least, so I'll keep this guy on my radar for now. -Steamhammer/Constructicons: Combined mode looks meh, as usual (not impressed with the different arm lengths, either), but the center bot looks good as a torso. I wonder how he'd look with a new paint job and if some Destructicons were mixed into the combined mode. -Thunderwing: Bot mode looks DEAD ON, not so much the alt. mode (hoping that's mistransformed as well). Will need to see better pictures of him, though, as I don't really care about him all that much. 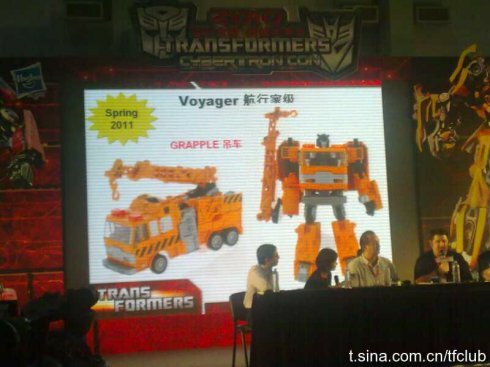 -Grapple: I already own the Inferno mold, and while I try not to buy a mold more than once (excluding the Classics Seekers), Grapple looks really nice. He's also orange, my favorite color. 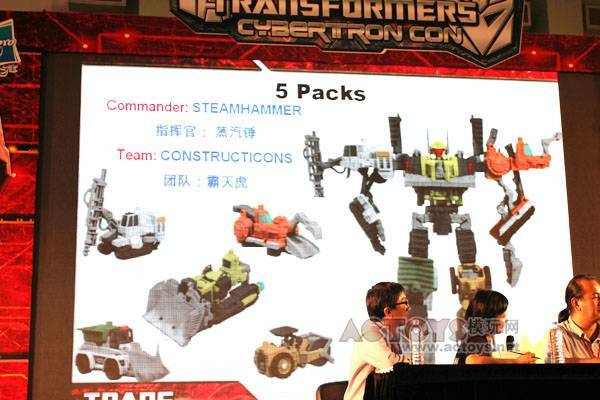 And is that a retooled HAND I see on the left arm in addition to the new crane and head? Lastly, it looks like there also will be a return of…RUBSIGNS! Aside from Scourge, all the Generations Figures have what look like Rubsigns on them (I can't see them on Jazz or Legends Optimus, but Jazz is missing a "4" on the left door and Optimus must have it on the left side, hidden from the camera). Even Grapple has one despite being HftD! Thank goodness they aren't due until next Spring, I need to save up money! Deluxe would be big enough for me. A Hoist/Trailbreaker mold seems like a no-brainer. I imagine so long as classics continues in some form,they'll get around to it eventually.